For added visual realism and an authentic natural stone appearance, Ashbourne paving incorporates riven paving and fettled edges. The result is an attractive and truly distinctive paving option that is perfect for creating an eye-catching patio feature. Ashbourne is available in four striking shades, two different sized patio packs of 12.96 sq m & 5.67sq m and a 1.8m diameter circle. Shown here in Cotswold colour. With all the charm and character of yesteryear, for the gardens of today. With its timeworn appearance, Bamburgh Mill looks as though it’s been in the making for centuries. 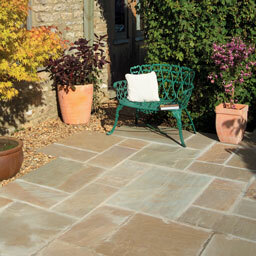 But it is a painstakingly recreated flagstone that is based on 17th century originals. Oozing period charm and timeless appeal, this vintage patio paving is the perfect choice for a traditional styled garden. 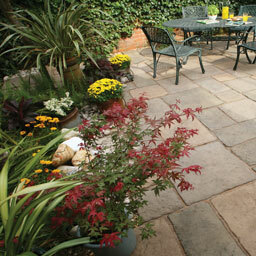 It is produced in Olde Blend, which is a blend of three complementary shades supplied together in 10.9 sq m patio packs. Imagine a paving solution that so authentically recreates the appearance of old timeworn York flagstones, it even incorporates tooling marks and weathered edges for that additional touch of visual realism. Old Town paving, with its slightly riven appearance, is the perfect choice if you’re looking to create a garden with a charming traditional setting. It’s available in three colours and also offers seven different sizes in order to give any patio a truly individual appearance. 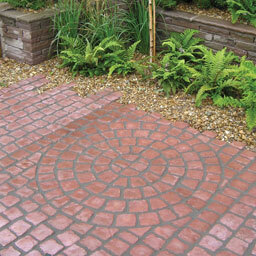 A hardworking, durable and cost effective paving solution. Available in two sizes and two finishes, Riven and Smooth, it is ideal as a base for utility areas and sheds. Cut down on costs without compromising on style. Old Riven is a paving solution that combines economy with aesthetic appeal, enabling you to create a stunning feature without breaking your budget. as good looking as it is cost effective, the quality, look and feel of Old Riven belie its low price tag and provide a stylish patio solution for the traditional garden design. Available in six sizes and four colours, also a 2.4m circle. Available in a range of four colours, each softened by fine white limestone chippings, contemporary Textured is a perfect combination of contemporary flair and durable functionality. A paving solution that is stylish enough to provide a charmingly modern backdrop for alfresco dining and entertaining, but also hardwearing enough to withstand the rigours of frequent outdoor use. Available in four sizes and a 2.4m circle. 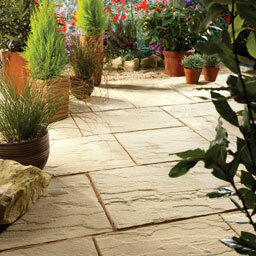 For a garden feature that is truly individual and quite unlike any other, choose Natural Sandstone. Every single paving slab is different thanks to the countless tonal variations and natural veining, the unique shape, colour and texture. Each slab is calibrated to ensure a thickness of between 20-24mm to make installation easier. With a range of different colours offering a wealth of design possibilities and riven profiles further enhancing the visual appeal, Natural Sandstone is a stunning patio solution for any traditional garden. 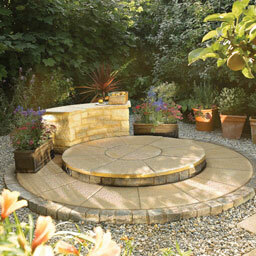 Have you always longed to achieve the rustic look and feel of individual cobbles in your garden? 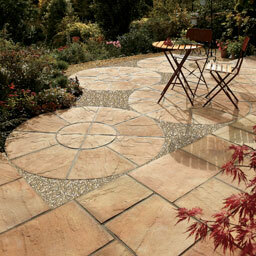 Now it’s easy with our unique Carpet Stones paving solution. The cobbles arrive pre-laid on an underlying flexible mat that can be cut with scissors to suit the shape of the garden and by simply cutting out the small half cobbles at the end of each section, they are easy to interlock too. Carpet Stones are ideal for pathways and driveways and also provide an ideal solution for awkward shaped patio areas and intricate designs. Available in two colours in straight or half circle units. 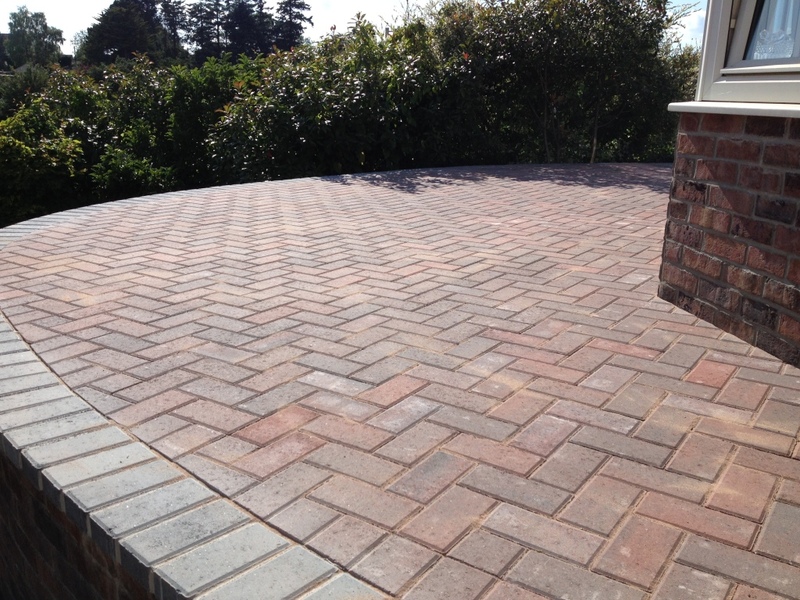 If you’d like a driveway that sets the tone for the rest of your property without blowing the budget, take a look at Driveway block paving. Available in seven different colour options, Driveway is a hardwearing and durable paving solution for patios, paths and driveways that offers a wealth of mix and match possibilities.